Black Sand Beach is in the southern part of the Big Island of Hawaii. 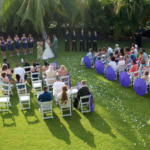 There are a few vacation rentals by the beach one can rent to hold the reception and/or get ready for the ceremony. As in the name, the sand on the beach is jet black, making for dramatic and unique wedding photographs. A white dress on the black sand really pops. The location also has a lot of palm trees and a small pond, adding to the available backdrops and scenery. There are not a lot of amenities nearby so you have to bring whatever you need. 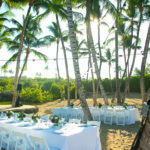 Please let me know if I can assist you as your Hawaii wedding photographer in picking your Hawaii wedding venue.